Discussed white privilege with my sister the other day, after she told me about someone tweeting about having to pay for college(university) so they obviously can’t be privileged. Well everyone has to pay for higher education some pay upfront, some pay after graduating and some don’t pay due to scholarships etc, so this point was slightly irrelevant. “I have the privilege of finding children’s books that overwhelmingly represents my race”. This all sounds crazy to a poc who deal with racism and discrimination on a daily basis. Not having to consider your race as a life altering factor is a privilege. People make the mistake of thinking materialistic, but when black people talk about privilege we are talking about day to day life, dealing with things that white people just don’t have to deal with. Even as a person of colour myself, I still experience some privileges based on a variety of things, this however does not take away from the disadvantages I have that are purely based around race. Being born in England with access to free health care is a privilege, however having little access to certain work sectors due to preconceptions of what black women are like in the workplace stop me and other black women from climbing the employment ladder. If you’re white and homeless you can feel like you have no privilege at all, however you being homeless doesn’t take away from the fact that you’re white so white privilege still applies to you. White privilege doesn’t disappear when you’re disadvantaged, it still exists as it is upheld by a system created to keep white people on top. 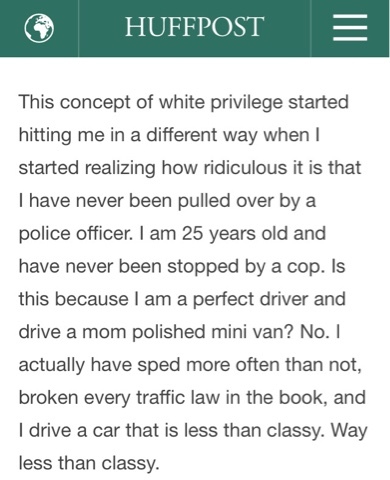 Hope this helped you understand white privilege. Click the links to see the full articles and pictures sources. Next Why Do Black Women Even Need Wigs, Weaves, Twists & Box Braids?